This page is a translated version of the page Gold Starry and the translation is 100% complete. Gold Starry origins can be traced back to 1909 when Maurice Jandelle began marketing Conway Stewart fountain pens in France, under the Gold Star brand name. That trademark however had already been registered, so in 1912 it was transformed into Gold Starry, with a choice to remark the English origin of the fountain pens, which were marketed until 1919. The first pens sold by the Gold Starry were hard rubber black or marbled safeties. First models were introduced around the 1913, were eyedropper filler or safety, identified by two digits (models 36 e 39), indicating the price in francs. At the beginning of the '20s Paul Jeanvrin and André Petit began a fountain pens production in a pavilion on the outskirts of Paris. In 1921 the two joined Maurice Jandelle and the Gold Starry was established as a wholly-owned French company, starting its own fountain pens production and stopping the import of English pens. 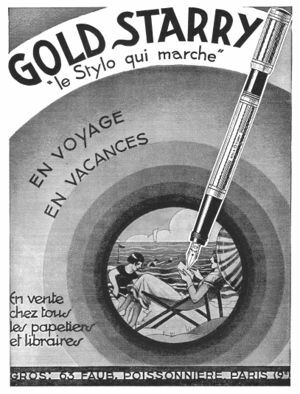 With manufacturing in France, the company adopted the slogan "le stylo qui marche", meaning both the dynamism than the reliability of their pens. The first pens had were gold nibs and black or marbled hard rubber body, eyedropper filler with no clip. In 1925 were introduced 256 and 257 Loaded safety models, characterized by the trademark consisting of a star, the Manifacture Francaise engraving on the barrel and some dotted rings on the cap top. The pens were still without clip, which was introduced on the following model 254. From this time (it's described in a December 1925 article) also a model with a peculiar filling system, a safety with pump filling, that show some links with England industries (the patent, nº FR-574169, is English, from a person that worked for Lang). In 1927 was introduced a lever filler model. Gold Starry was one of the first French companies to use the celluloid getting excellent quality colored pens with vibrant colors and with gold plated finish and gold nibs, able to compete with imported American pens. Around 1929 the earlier models were discontinued and a new range of celluloid pens was launched, in black, red and white marble, lapis blue, cardinal red, green jade and jasper. There were also made ​some solid gold pens. In 1929, with the search for a filling system that would allow a greater ink capacity, a particular model, the Rapex, was produced, with an original filling system (see patent nº FR-691384) driven by the rotation of a bottom knob. The pen however had little success for the delicacy of the system, and therefore is rather rare. In 1933 in Maurice Jandelle was replaced by M. Perouse, an executive of the company Viala Lilliput, producer of luxury pens in gold and silver enamel, which were also made ​​by the Gold Starry. In addition, with the emergence of the streamlined style introduced by Balance, in the '30s the production of the Gold Starry passed from square shapes of the 20s to sleek lines. There remained the distinctive mark of the clip, jagged shaped and ending in a arrow. During the war the company suffered from the obvious difficulties faced by all competitors, with perhaps the aggravation of having to support an English brand name. After the war, production was increased at the expense of quality, that was acceptable, but not up to the best time of the company. Like other producers Gold Starry suffered heavily the crisis from the ballpoint pen introduction, which it tried to react by building cartridge fountain pens and participating in 1959 to the consortium for the production of the Visor Pen. The Gold Starry was able to move forward and overcome the crisis period with the differentiation of the production, going in the market of luxury office accessories (with calendars, rulers, letter openers) produced in gold-plated metal. In addition, a line of luxury ball-point pens, always gold plated, had a remarkable success. The company, however, suffered heavily from the effects due to the blockade imposed on the gold price, which made its products too expensive then when it ceased sent it off market. Despite all the efforts in 1980 Gold Starry closed its doors. ↑ in the references is reported the 1931, but this advertisement allows to backdate the introduction at least to 1929, the year in which the relevant patent was applied for in Germany (nº FR-691384), even though it was granted in France only in 1930. This page was last edited on 6 January 2019, at 18:04.